The days are getting shorter, there is a hipster wearing every item of clothing in his closet, drinking a pumpkin spiced something or other, and I’ve got a wicked cold. These could all only mean one thing: It’s the beginning of fall. While drinking a spicy gourd is not really my thing, fall definitely is. I love the colorful foliage, and the (to quote my hero circa 2005, Rachael Ray) yum-o food. Being from a quaint, albeit snobby, small town, autumn was our time to shine. I fondly remember not paying attention at the big high school football games. I would even have to work at our pathetic but cute fall festival which showcased horrifying homemade scarecrows and blue haired woman giving out sugar-free candy if you promised to donate to the church. But there was one special day where we really pulled out all the big guns. Halloween. Oh my bored gods, was Halloween the main event of Snobville! Kids went ham, adults used up disposal cameras by the dozen, snapping the best shots of their children in the most up to date costumes out there. Parades, haunted houses, free candy, overly kitschy theme parties, and goofy decorations as far as the eye could see. It was perfect. Once I got to college, I found myself very sad as Halloween approached. This was a shocking first. Had I become too old to enjoy my favorite holiday? Soon the existential crisis checked in for what seemed like an extended stay. To make things even worse, I had class until 10:00 pm on Halloween so I couldn’t even go home to steal candy from little kids give out candy. My class was late enough that I couldn’t even watch a cheesy Halloween movie afterwards because I had class the next day at 8:30. Talk about mega bummer. So I put my best foot forward. Put on my classiest pair of cat ears and high tailed it (pun intended) to my six hour studio class. 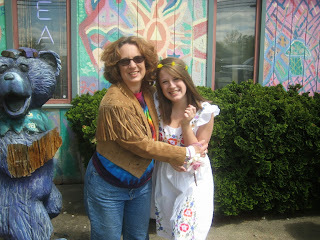 When I came home that night I was blown away by how much of a nut my mother is. She managed to sneak into my dorm room and tee-pee my side of the room, right down to the pictures I had of my cat. She did this through what I could only imagine was a Grade A espionage mission. For the full story check out the blog post on November 1st, 2012. Readers, if you haven’t picked up on it by now, my mom is incredible. She always finds ways to make life interesting and unconventional. Growing up it wasn’t her activity in the PTA that made her special to me. It was her ability to make even the most mundane things seem silly. To give you some perspective, she used to moo at my sister and our friends, and for some reason we just LOVED this. Even when she was in the PTA she did things that made me feel so special. For our fifth grade holiday party she made a huge batch of my favorite Christmas punch and served it from a fountain! I felt like the most important person in the world that day. I guess that’s what is so incredible about my mom. When you least expect it, she will do something so amazing that will make that existential crisis go find someone else to bother. When she asked me to do a guest blog post about a Halloween memory, I knew right away that I had to write about my first Halloween in college. Because no matter how many wonderful years of parades and trick or treating I had, nothing will be sweeter than knowing you have a nut for a mom who loves you so much she’ll waste a whole two rolls of toilet paper just to brighten up your day. There's no mystery to the scary part of Halloween. If good Spirits can cross the Veil and commune with us, so can bad ones. Let's not sugar-coat it. This holy season ushers in the dark days, and some phantoms are dark, evil, and dangerous. Two days ago a partly-decomposed body was found about two blocks from my house. The remains have been identified as a 26-year-old male from Philadelphia. This young man did not just decide to choose a marshy area surrounded by houses and just crawl in there to die. Somehow he was placed there. And with Snobville being what it is, we residents will never hear another word about this unfortunate fellow. But it's scary. It's scary to think that someone lay decomposing in a location where he was bound to be discovered -- if not by people first, then by vultures first and then by people. This will be a different sort of Samhain for me. I am awash in fatigue and anxiety. I have a feeling that the evil spirits are prevailing. In ancient times the harvests did not always yield enough to see everyone through the winter. There must have been many grim Samhains, with dread misplacing delight. My personal plan is to deal with the dread. A sense of calm must be restored. A sense of healing must be established. The first step is to smudge the property thoroughly. The second is to light more jack-o-lanterns than ever. The third is to petition Brighid for a safe and tranquil home. The fourth is to acknowledge the faeries respectfully. The last is to find a home for all the candy I bought that won't get doled out to trick-or-treaters. I have a feeling that very few kids will be on this block looking for loot. There's a pond of about ten acres a block from my house. It is surrounded by large trees and larger school buildings. It spills into a lower, smaller pond and from there into a sluggish waterway known as the Cooper River. This pond can't win for losing. A few years ago, someone released a full-sized cayman into the pond. Animal Control refused to believe the reports until the ducks started disappearing. Then AC put out a dragnet for the cayman and failed to find it. It may still be in the murky depths, waiting for more ducks. But I don't think so, because more recently the pond suffered a massive influx of raw sewage when the ancient pipes of Snobville burst. The entire pond area was cordoned off for months while the locals struggled to clean things up. The pond's fortunes seemed to be reversing somewhat this summer, when out of the blue some kind of funding came through that put aerators into the water in well-regulated intervals. But alas, this afternoon the poor little pond got more grief. The police started creeping past my house at about 5:30, followed quickly thereafter by one of those very loud helicopters that hovered right overhead, just above the trees. The evening news revealed that a corpse had been found in the shallow section. The Monkey Man grew up right next to this poor little pond, and he can remember a time when kids swam in it during the summer months and skated on it during the winter months. I've never known it to be in that natural state. It's hard out there for an urban pond. Don't get me wrong, I'm not cold-hearted. I care about people. But to me, a pond is more alive than a person. It's an aggregate of a thousand kinds of life. Except for my poor little pond, which is visited far too often by the grim vestiges of death. With the Veil so thin, I'm feeling my grandmother within and about these days. They were giving away frozen turkeys at the grocery store yesterday, and I got a 20-pounder. I cooked it today and even whipped up a tasty dessert. That's Grandma at work. But tonight I'm thinking of my dad and how he led me to my current Path. Dad was a Baptist his whole life and hardly ever missed church. This meant that I grew up going to church every Sunday. Dad taught Sunday School and sang in the choir. He was always torn philosophically about his faith, though. The scientist in him made him skeptical, and the more he read in the Bible, the less he liked it. Still he persisted because he liked the core message of the New Testament. I think of him as a Thomas Jefferson Christian, cutting out the stuff he didn't like and keeping what worked. When Dad took to his deathbed, he told me he saw Peter Pan standing in the doorway of his room, with his hands on his hips. At the time I was teetering towards my current Path, and I found this information very intriguing. I felt that Peter Pan was a Portal Being who had come to guide Dad across the Veil. Soon enough, Dad and Peter went off together. Shortly after Dad told me about seeing Peter Pan, I found myself in the Methodist church I had attended in an effort to replicate my childhood experience for my daughters. I don't remember why I was back in that church that day -- I had pretty much left it emotionally, and Heir and Spare were not with me. Anyway, this Methodist church had a little mini sermon for kids after the opening hymn and prayer. The kids came forward, and from the rafters of the church a movie screen descended. The screen must have been new, I don't remember seeing it before that. The youth pastor gathered the children around and directed their attention to the screen. And up came the footage of Peter Pan, from Disney, leading his charming Lost Boys through the landscape of Neverland. There's a song in the movie, do you know it? "We're Following the Leader." That's the clip that showed on the screen. When the footage ended, the youth pastor posed a question to the Methodist tots: "Who is the leader we should follow?" I stood up. I was in the balcony. I said, "The leader is Peter Pan." I walked out and have never returned to that church, except once, when I gave blood in the basement. Peter Pan led my dad away, but I don't think Dad is a Lost Boy. I think Dad is a Found Boy, eternally young, capering at play in the wake of a long, hard life in the apparent world. Jesus isn't everything. He isn't the Leader. 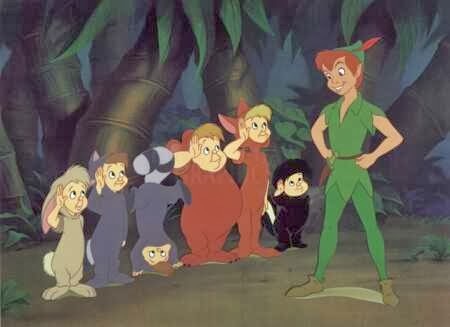 Peter Pan is the Leader, and when you decide to follow him, be sure you are ready to go with him forever. What is more heavenly than eternal childhood? One of the maxims of the famous Temple of Apollo at Delphi is Θεους σεβου – worship the gods. When asked, I usually give a rather generic definition of “worship” – acknowledging what we find of greatest worth. That definition accommodates polytheists, monotheists, and non-theists, and it accurately reflects the practices of our mainstream culture that worships money, power, entertainment and celebrities. But I prefer to take this maxim in its original context and actually worship the gods and goddesses of our ancestors. I worship the gods by learning who they are. The Greeks have a wonderful collection of stories well-preserved from antiquity. The Norse and Celtic stories are less certain (they weren’t written down till well into the Christian era), but they’re more than adequate for telling us who the gods are and what they value. Other cultures and other gods have even less, but even if all we have is a name or an image, it’s some place to start. Modern scholarship may be largely done by non-theistic academics, but their work can be helpful as well. I worship the gods by talking to them. Prayer is a very old spiritual practice, and the fact that some people pray like a four year old visiting Santa Claus is no reason for us to abandon it. If there are ancient prayers to your gods, use them. If not, write your own. Or simply stand under the sky and speak the yearnings of your heart. 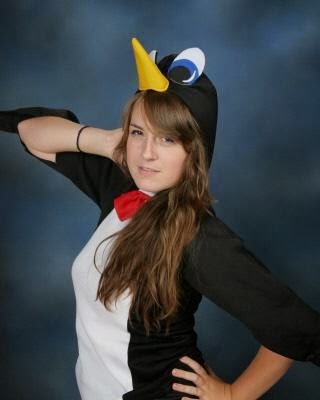 Not sure what to say? Start with what you’re thankful for. Gratitude alone isn’t enough, but it’s a good place to start. I worship the gods by listening to them. Sit in meditation and listen with more than your ears. It helps to have a statue or a picture or a candle as a focus for your intention, but rocks and flowers and trees work well too. Listen. I’ve yet to hear an audible voice, but I’ve experienced thoughts coming out of nowhere, feelings of peace, and calls to righteous action. I’ve seen signs and omens in the natural world. None of that will convince an atheist I’ve actually heard a goddess, but it’s more than enough for me. I worship the gods through hospitality. I greet them daily. I burn incense. I offer them food and drink. The gods are neither our servants nor our masters. They are our most honored guests – I try to treat them appropriately. I worship the gods by embodying their virtues. I worship Cernunnos by caring for the natural world. I worship Morrigan by reclaiming sovereignty for myself and for others. I worship Danu by working to create a new and better world. I will never have all their strength and wisdom, but through diligent effort I can become more like them. I worship the gods by telling their stories. Even the old goddesses and gods whose names are part of our mainstream culture (such as Apollo, Jupiter and Isis) are rarely known as anything more than caricatures, as “the god of somethingorother.” When we tell their ancient stories, we present them as the full, complex beings they are. When we tell their modern stories, we remind people they did not die with the coming of monotheism but are still active in this world... and still looking for people to help with their work. There are many ways to worship the gods. These are a few that have been helpful to me and to other modern polytheists. Because of our worship, divine boredom is growing smaller and smaller. Note from Anne: Welcome to "The Gods Are Bored!" It's my pleasure to present today's guest blogger, Kris Bradley. 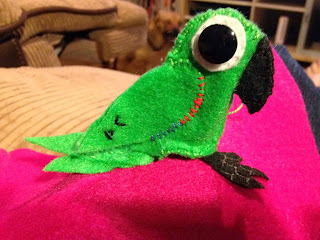 Two years ago, Kris created a poppet for Decibel the parrot. At the time, Decibel's condition was very much up in the air. Well, Decibel has made a complete recovery, every last decibel of sound restored and then some. I attribute Decibel's current health to his poppet, which never leaves the vicinity of his cage. I'm so pleased that Kris has offered this overview of poppets and how to create them. Thanks, Kris! There are many who still think that poppets are only associated with the Vodou* religion (and we'll get to that misconception in a moment), but poppets go back much further than that, back to the ancient (some would even argue prehistoric) times. Poppets have been traced to countries all over the world, from Greece and Rome to Africa, and from Egypt to North America. In ancient Egypt, Ramses III was said to have been plagued by issues caused by wax poppets. The women of Ramses' harem and his wives, along with several of his enemies, set about causing his death. According to the Papyrus Rollin, a butler named Mesedure procured a number of wax figures and smuggled them into the harem to use against the King. In ancient Greece, poppets were called Kolossoi and were used in a wide variety of ways. One of the most common uses was for binding deities. This could be done for protection from harm, such as binding the god Ares to ensure safety on the battlefield or binding a deity to a specific home or village to bring their protection. Kolossoi were also used to bind dangerous ghosts or spirits called "Hikesioi Apaktoi" (hostile visitants) and lead them to the Land of the Dead. The Kolossoi were crafted out of clay, wood, or lead and the shape would often be bound in rope, stuck with nails, then encased in a lead container and buried. When using these poppets for permanent protection, the Kolossoi would be rebound on a regular schedule, to keep it's powers working. Moving forward in time, the English King George IV's wife, Caroline of Brunswick was said to have created at least one poppet of the king, sticking it with pins and thorns, then throwing it into her fire to melt. The two had a tumultuous relationship, George having little respect for his wife, even writing about their wedding night that their consummation "required no small [effort] to conquer my aversion and overcome the disgust of her person." What a peach. On a side note, Caroline is often labeled a "witch", probably more to do with her outspokenness and "shocking" behavior (such as drinking in excess) than to do with her poppet making skills. 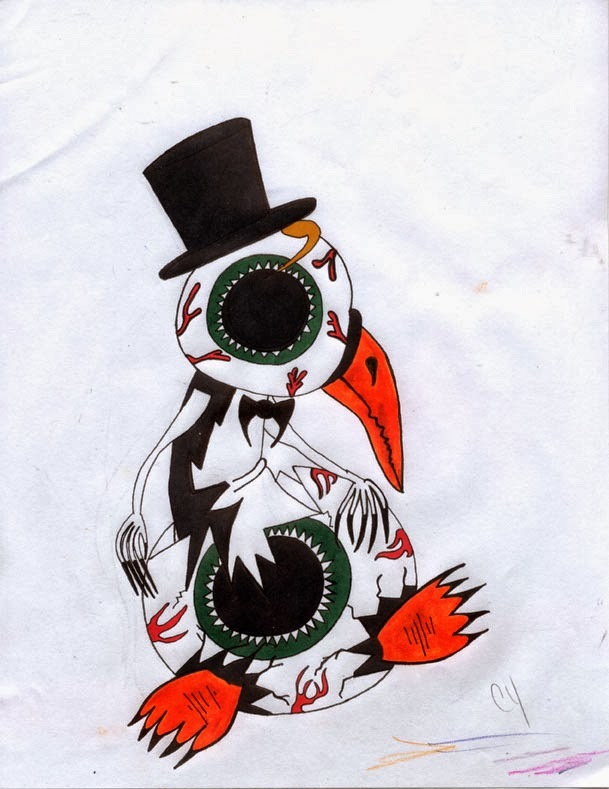 In Central Africa poppets called minskisi (or singularly, "nakisi") were created specifically for spirits to inhabit. These types of poppets are often referred to as "nail fetishes" because of the nails that are driven into them. The items used to create these poppets were called "bilongo", which translates to "medicine". Bilongo might include plant matter, bird claws, fabric, cowry shells, stones and/or clay. A subcategory of minkisi are called "nkondi", female power figures. Nkondi would be evoked to enforce oaths, to bring justice or to cause or cure sickness. There was also the "minkondi"("hunter") who was used to go after those who had done the creator wrong. Minkondi often came in a male/female pairing. Many Native American tribes have a history of creating poppets. Hopi tribes created Kachina dolls, carved from cottonwood root. Kachina dolls were thought to embody spiritual beings who would bring good crops, rain or protection during rites of passage. Ojibway warriors created wooden images of their enemies, and would stab the image with the intent of causing their enemy death. After the stabbing, the popped would be burned or buried. Native people of Peru molded their enemies out of fat mixed with grain. This poppet would be burned in the middle of the road to cause the enemy harm. This act was called "burning the soul". What we now think of as "Voodoo dolls" probably (though there are differing opinions on this) did not start in Haiti, where the Vodou religion was born. Instead they most likely originated in Louisiana, in the New Orleans area, where they still flourish in tourist shops. In modern days, poppets still have their uses for magical practitioners of all sorts. Consider the "kitchen witch" which hangs in many homes. This type of poppet has been used for centuries in Norway (where they are thought to have originated) and are popular still today to bring the home good luck and ward off evil. Raymond Buckland has quite a detailed section on poppet magic in his book, Buckland's Book of Saxon Witchcraft. Dorothy Morrison, in Utterly Wicked, teaches us the fun of making poppets with fashion dolls. I personally create poppets for a variety of positive uses (under the kitchy name of "Voodudes™) including, among other things, healing, fertility, and prosperity. As for making your own poppet, there are so many crafty ways to go about it. Pour out wax from a lit candle (or purchase microwaveable soy wax at the craft store) onto wax paper in a human shape. Before the wax sets, add any herbs, stones or taglocks (items attaching the poppet to its human counterpart, such as hair or nail clippings). Poppets can also easily be made from scraps of cloth, paper, potatoes or apples (which are great for burying) or even air dry or bakeable clay. When your poppet is ready, you'll want to connect it to you (or show who you've made it for how to connect it to them). Simply carry it with you as much as possible for a week or two, and occasionally blow your breath onto it. You might also say a charm to it, such as "You and me now are we." Many poppets can be kept, recharging them on occasion in the same way. If you find the need to dispose of a poppet, you'll first need to break your connection with it. Again a charm can be said to the poppet, such as, "With thanks and love, I sever the link 'tween me and thee." The poppet can then be submerged into a bath of salt water and baking soda, then buried or simply thrown away. Prosperity: coins, allspice, basil, tiger's eye, garnet, peppermint, ginger, green or gold material. Fertility: Green material, rose quartz, egg shell, moonstone, rice, any sort of seed or nut. Love: Red material for adult love, pink for innocent love, yellow for the love between friends. Basil, rose petals (in same color combinations as material), chili peppers (for lust), heart shapes, calendula, cloves, catnip, amethyst, moss agate. This is post copyright to the author. It may not be reposted, reprinted or distributed in its entirety without express written permission of the author. Links to the article can be freely shared and are appreciated. * I use "Vodou" when referring to the religion of Haiti, "Voodoo" when referring to "Voodoo dolls", less of a religious item and more of a Hollywood trope. Taussig, Michael. The Devil and Commodity Fetishism in South America. Chapel Hill: the University of North Carolina Press, 1980. Saturday, October 19 is Global Frackdown Day, in which we are encouraged to voice our opposition to hydraulic fracturing, the process of drilling deep into ancient shale layers to extract trapped natural gas. I am currently strongly opposed to fracking. But note that I say "currently." Perhaps I'm a cockeyed optimist at times, but I feel like human ingenuity can, given time, solve some engineering and logistical problems that would make fracking safe and sane for America. We have not reached that point yet. The existing technology -- no matter how much Big Energy wants to spin it -- is demonstrably unsafe. When you add to that the proximity of fracking sites to major watersheds that serve the drinking needs of millions of people, gas extraction currently has too high an environmental price tag. Where are the fine young minds that could make this process viable? I guess they haven't arrived at the banquet yet. When a country can't get a national insurance plan up and running on a web site, given all of our sophisticated computer technology, it makes sense that sucking gas from a mile deep in the planet would be out of reach ... right now. So we at "The Gods Are Bored" go on record as opposing fracking until such time as the process can be made safe and unobtrusive. In the meantime, perhaps advances in other, less damaging, sources of energy can be developed and refined. Stop fracking now! Back to the drawing board. Well, all of you Pagans know why we carve and light jack-o-lanterns, right? It's to keep the evil spirits at bay while the Veil is thin. I dunno, maybe it's this government shutdown that has me thinking of the many verminous spirits out there who richly deserve the ire of the most fearsome, well-carved, and brilliantly-lit jack-o-lanterns. Ted Cruz is the villain du jour, but trust me, striplings ... he's stupid, yea verily a moron, but there are worse ones abroad beyond the Veil. 1. George Wallace. Ugly, racist, and hateful. No, he never tried to bring down the global economy, but what a fine representative of this nation he was when he did all he could do to keep black people from attending state universities! 2. Richard Nixon. News flash. He was a crook. 4. Ronald Reagan. First president in a very long time who openly took from the poor and gave to the rich. They all do it, but Reagan bragged about it. The world is a darker place in his wake. 5. James Earl Ray. Again, did not shut down the government, but cold-blooded murder that spawns martial law in more than a dozen cities is amply worthy of a jack-o-lantern. 6. Sam Walton. They say he was a nice man. But he fathered a brood that is enslaving the globe. 7. Joe McCarthy. No shutdown, but ruined careers in all walks of life. Want to know what the Tea Party end game would look like? Red Scare. That's my guess. 8. Pol Pot. America has yet to produce such a leader, but give us time. 9. Warren Harding. People forget this guy, but only because he died young and then his scandals were discovered. 10. Rush Limbaugh. Yeah, yeah, I know he's not dead, but I'm being proactive. An ounce of Halloween protection is worth a pound of cure. Housekeeping note: I've ditched the captcha (I think). Feel free to chime in with your own list of nefarious scoundrels. I might have missed a few who are edging out my dear grandmother as she tries to hover lovingly at my side. Spare is the director and cinematographer. Heir is the star. Hello, soul mates, and thanks for dropping by! We're now 2,000 posts into "The Gods Are Bored." Time to call in reinforcements! I've asked for anyone who has anything to say to let me know if you want to guest blog. Today we meet a fabulous pair who I think I'd like to have as monthly visitors: Rita and Pam. Please click the link! Rita and Pam are offering up a simple and fun seasonal craft ... and doing it with humor. Spoiler alert ... who can resist googly eyes? I can't believe I have written 2,000 posts for this blog. I love to write. I just do. I thank the spirits of my mother and father for insisting that I take Personal Typing in summer school in 1973. I thank the nice lady on the Bookmobile who brought stuff for me to read. I thank my English teacher, Robert Hershey, at South Hagerstown High School. I thank the Johns Hopkins University for admitting me. I thank Gale Group for almost 20 years of employment as a writer. I loved every single minute of it (until we had to start coding, but that was near the end). I bow and give homage to the faeries for leading me to this Path. All glory, laud, and honor to the great Bored Gods! During this holy month, I have asked others to contribute to "The Gods Are Bored." If you would like to do so, by all means drop your request in the comment box. and even if you don't normally watch blog videos, this is a great one. About midway through, you will see something fabulous. This is why my friend Chas Clifton brought it to my attention. I've just realized something. I might just be a bad Pagan. I'm just too busy. Today was the first day of my _second_ new job in less than three months (I'm currently doing both a full time and a part time gig at the same time). Plus I have a husband, three grown kids, a beagle, a ginger tabby and two female guinea pigs. This zoo's full, folks. Catch the next Ark. So I made myself a promise recently. Because this new addition to my chaotic life is probably permanent (ie now that I have work circus as well as home circus), I'm determined to take 5 minutes out of each day. Just 5. Maybe 10. And just do _something_ to honour the Gods and the Ancestors. Say a thanks for an answered prayer, or mentally go through my day and count my blessings, or even just to let my mind go completely blank, and allow myself to relax. And pray for the strength to keep up the frenetic pace they seem to think (and possibly delight in) I can handle! Do you do this? I'd love to hear about unique little rituals you do purposely, or even accidentally. Thank you Anne, for asking me to do this! I had so much fun! There are ordinary days, and there are memorable days. Saturday was a memorable day. In fact, a navel gaze for the books. I'm going to put on my P. G. Wodehouse voice and tell the Rummy Affair of the Day Trip To Learn about Mr. J's Ancestors! Saturday was hottish, one of those I-don't-belong-in-this-month-temperature-wise heat freak days. It's usually like that when the South Jersey Pagan Pride Day happens. I customarily biff in to the SJPPD festivities and slink off again, mainly because the event is held on a field that has zero shade except under the vendor tents. Add temperature and humidity to that locale, and you get the distinct impression that the busy god wants to fry you alive, just as He promises in the Old Testament. However, I had exactly 45 minutes from the start time of the SJPPD to visit, and I wanted to meet Selena Fox, who was the guest of honor. I had no trouble finding her, and in under two minutes we were long-lost sisters who could have spent the whole day engaged in jolly conversation. But, alas! There was ancestor work to be done! Almost before I had said howdy, I had to bid farewell and rejoin the spouse for a sojourn into Maryland. Our quest, Hub's and mine, was to reconnoiter with some of his father's cousins to talk about the family tree and what those cousins recalled about East Baltimore back in the day. Only our destination was not East Baltimore, which we both know like the back of our hands, but somewhere in the countryside around about Jarrettsville, in extreme northeastern Maryland. Mapquest got us right to the door of a massive McMansion way out in the country. I must say it took almost as long to drive there as it would have to get to East Baltimore ... which, thank the gods I didn't know beforehand, or Selena would have hit the cutting room floor. We tooled up the circular drive at about 2:00 and took up residence in a spacious, marble-countertopped kitchen, chock-a-block with Baltimore-inspired ham sandwiches. Mr. J got his voluble cousins up and running in no time, and they were competing to tell stories about the previous generations of his family and their lives in Baltimore. As with all ancestor work, this was a holy and wonderful thing, if tragic at times. Mr. J had billed this as a quickish visit, but you know what happens when family members get together and are encouraged to reminisce. Hours passed like minutes, and before I knew it, the clock registered 6:00, and I had told Extra Chair I'd be home to make her dinner. I have to hand it to her. She took the prospect of starvation in stride and assured me she would be fine. A real self-starter, that one. Then the clock went into overdrive, and 6:00 became 8:00, which brought an end to the ancestor work and the beginning of descriptions of cruises taken by the various cousins, thus ending any interest I had previously taken in the proceedings. Spouse and I bid farewell to the cousins at about 9:00 and got in the car to make the 80-mile drive home. It was now dark as pitch. But what did that matter? We were in Maryland, right? The old home state for both of us! Bosom of our ancestors (well, all of his and some of mine). How could we possibly get lost? It had been fairly easy to find the McMansion in the daylight, with refreshingly accurate Mapquest directions. We didn't have the reverse directions, nor did we have a GPS. At the first opportunity to take a wrong turn, we took it. Then we followed it endlessly. 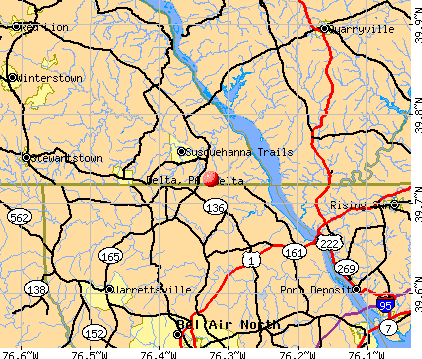 You see, Jarrettsville is fairly close to a rather largish river called the Susquehanna. Logic would dictate that if you were driving in the vicinity of Jarrettsville, you would eventually come to this ancient and sizable waterway. We didn't come to the river. We didn't come to a town. The road kept getting smaller and smaller, more and more curvacious, with lower and lower speed limits. And no other traffic. That's always a bad sign. After about 30 minutes of country roads with no signage and lots of bumps and curves, we arrived in the teeny weeny borough of Delta, PA. Now, it's not as small as Artemas, PA, the seat of ancestors Johnson ... but it was tiny. And deserted. So I plugged the town's name into Mapquest and got a long string of directions that were absolutely no help at all. Note, dear reader, how far we had strayed from the mighty Susquehanna! 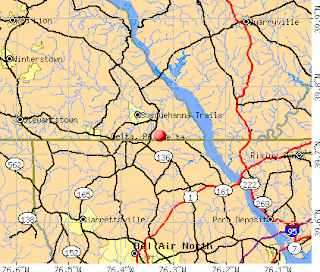 And even farther from Jarrettsville. Back to our journey. We passed through Delta, made another wrong turn, and suddenly I saw a veritable metropolitan airport's worth of lights off to my right. I pointed them out to Mr. J as a sure sign we'd at least found the river. He dutifully eased the Chrysler in that direction. Soon we were headed straight for the lights. Which turned out to be the Peach Bottom Nuclear Power Plant. We figured that out when we saw signs that said, "PEACH BOTTOM NUCLEAR POWER PLANT. GET THE HELL OUT OF HERE UNLESS YOU BELONG ON SITE. TURN AROUND NOW." So I didn't get to tour that one. Oh well, you've seen one nuclear power plant up close, you've seen them all. But the presence of this energy-generating facility explained the lack of homesteads and towns in the vicinity. We doubled back to Delta, PA, and that's when I noticed the old-fashioned GPS system, right at our beck and call. That would be a fire house with an ambulance sporting two on-duty paramedics. Human beings! Say what you will about computers, but give me a human being any time when I'm lost, especially if it's a public servant. I had a nice chat with a very young (and extremely cute) paramedic. He couldn't direct me to Interstate 95 (another indication that we had officially arrived in the M. of N.). Fortunately, he could give ironclad instructions to Route 1, which is one of those old wagon train pikes that used to link the big cities in the days of George and Ben and Tom Jefferson. We found Route 1 and began our trek northward towards Philadelphia. And this is when all the motion and the length of the day caught up with me. I started to feel a tad bit queasy. This morphed into slightly sick, which evolved into really nauseous, which quickly gave birth to "find someplace to pull over, Honey, I need air real bad." After a couple of near-turns, the valiant Mr. J steered the Chrysler into a Toyota dealership. I staggered from the passenger seat, clutching my stomach. And suddenly I was surrounded with those red flashing lights that can only be emitted by the state constabulary. In short, a police car had followed us into the Toyota parking lot, and two suspicious troopers with flashlights were bearing down on us. By this time it was 12:15 a.m. Sunday morning. I can't say I blame the conscientious gendarmes for their perusal of our vehicle and their probing questions, the main one being, "Have you been drinking?" I don't imbibe. But if I was a tippler, that trooper would have known it, because he was hovering quite close enough to smell my breath. I explained our situation to the trooper, who was about 8 feet tall. Then I asked him, "Why did you follow us in here?" He said, "The vehicle was driving erratically." After navigating 2,000 miles of twisty country road, Mr. J didn't appreciate hearing that. On we slogged toward Philly, eventually arriving at the old home place at 1:15 in the a.m. By that time, Selena Fox and the history of East Baltimore were distant memories. All I wanted to do was crawl under the garage and stay there until spring. I just realized that this is not my 2,000th post, because there are a few I never published. But I do wish this was #2,000, because rarely have I had a day and night that packed so much drama into so few hours. When the events were happening, they weren't a tad bit fun (except for meeting Selena). But in retrospect, there's nothing quite like surviving a brush with nuclear energy and the Pennsylvania State Police in a futile quest for a city the size of Philadelphia. Someone once asked me to blog about travel more. I hope that reader is perusing this, because I call this a travel post. I went to Delta, PA. Couldn't find it again without assistance from the CIA. Welcome to "The Gods Are Bored," post 1999! Wow ... I wonder if the site will crash when I hit 2k! Quick business updates: Mr. J will be having surgery. It will last an hour, he won't need hospitalization unless there are complications, and the doctor said he'll be all better in three days. I'd find this hard to believe if I didn't look across the street and see my neighbor, who just got a new freakin carotid artery four days ago, and he's mowing his lawn. Other new business: My school ITs blocked blogspot, so I can't post from school. Such a forward-thinking place! Other schools are encouraging students to create blogs, but my school thinks such freedom to express oneself in a public forum is a commie plot to undermine the safety of the nation. Sometimes I find myself in a place, and I look around, and I think, "My gods, how did I get here?" This happened Friday night when I attended the symphony with my colleague. This colleague has season tickets to the Philadelphia Orchestra, and every now and then her husband can't attend for some reason or another. I can't stick opera at any cost, but I like a good orchestral program now and again. And when your orchestra of choice is Philadelphia's, you know it's going to be top notch. Can't say I know much about classical music, but I did play a little piano and violin as a stripling, so I'm not in completely foreign territory when I go see a symphony. So the colleague and I met at a Japanese eatery in Snobville, tied on the feedbag and noshed some sushi, then we got on the mass transit and rode into Philly. We exited the train at 7:56, sprinted like madwomen three blocks to the Kimmel Center, took the four flights of stairs two at a time, and the bemused usher kindly opened the door and let us into our tier, even though the first notes had sounded. I've often wondered why people would pay good money to go and sit and watch other people play music that can otherwise be bought on CD and listened to over and over again. Well, this much I think I get now. From our nosebleed seats, my c. and I could see the conductor's score, we got all the body language in the half of the assembly that we could see performing, and it's just ... wow. You marvel at those human beings who can do something as complicated as creating symphonic music. It doesn't look easy, but it looks like a worthy endeavor to bring something beautiful into the world. I've always been really snobby about Mother Nature's symphony. I can identify many bird calls and insect sounds, chipmunk squeaks, squirrel barks, frog peeps, wind-in-the-trees, and water trickling ... all that music that comes from the world. But I still have to doff my headband to a bunch of top-notch people, with top-notch instruments, and a top-notch conductor, who can create such incredible sounds by moving their hands and feet and fingers. Back to the "how did I get here?" My mother was big on Broadway musicals and ballets, so I got dragged to the Kennedy Center in Washington, DC a good bit as a tot. It had just opened and was the pinnacle of poshness in those days. But a trip to the Kennedy Center included a two-hour drive each way, traffic jams, parking garages, and an obligatory dinner at a Howard Johnson's or something on the way home. In short, getting there and back was an ordeal. And my dad invariably complained about the whole process, including its costs. Where I live now, I can sit down to a relaxing plate of sushi at 6:30 and slide into my seat in the truly, absolutely, and inexpressibly posh Kimmel Center 92 minutes later. The rapidity with which I can land in this palace of culture from where I live always takes me aback a bit. It's like I associate fancy music halls with long car rides, and when it doesn't turn out that way I am baffled. Do you have any lasting imprint like that from your childhood? I'll conclude this sermon by saying that it's a shame the orchestra seems so geared toward old, rich, white people. Accent on the rich. I'm going to look into the price of tickets, because I had such a good ol' time. But I know that purchasing one of those red velvet seats in that Kimmel Center isn't going to come cheap. Maybe I'll steal Spare's college ID. She lives right across the street from the Kimmel Center. She wouldn't miss it for a few hours. I felt sorry for the oboe soloist. It was really, really humid in there. At one pause he completely dismantled the instrument, ran a brush through it, reassembled it, and hit his mark flawlessly. Not a great night for an oboe concerto. The bored gods have spoken. I am not to do Extra Chair's assignments for her, no matter how dim-witted they are. I've been sick all week with a dreadful head cold. The symptoms began on Sunday afternoon. Now it's Thursday, and I'm just starting to feel better. The bored gods are brilliant. They made me just so sick that my work was hell, and I crashed in a heap the moment I came home. But They didn't make me so sick that I couldn't go to work. For those of you who believe that head colds are caused by breathing in viruses from someone who sneezes, have you no faith? The bored gods want me to be honest. They are correct. Lesson learned. Some time within the next week I will be writing the 2,000th entry here at The Gods Are Bored. Oh my bored gods! Should I interview a deity? Offer up some frank talk on lingerie for parrots? Pay homage to the Spare? Salute the faeries? Or should I dig a little deeper for that essential insight on the Bill of Rights? I haven't poked fun at Cindy Jacobs and her Christian militants for awhile, but that's because I saw a video of Cindy in which she rambled about Leviathan, insulted every other religion that ever was, and drooled like a quaalude abuser. She's her own worst enemy. She doesn't need me. I haven't devoted much time to right-wing radio lately. But here's a quickie: I can only listen in 30-second bursts, but the half minute I got yesterday was some woman complaining bitterly about having to purchase health insurance. "I never get sick," she ranted. "I haven't been sick a day in my life. I haven't ever seen a doctor! Why do I need health insurance?" An excellent question! Flawless logic, right? She's never been sick, so she'll never get sick. Maybe if we exempted people who never got sick and never will, we could lose this gridlock in Washington, DC that is depriving me of the opportunity to go to Independence Hall. But I think the accent ought to be on the and never will part. Sign on the dotted line ... "I will never ever ever get sick, and if I do, I won't need a doctor or any medicine."